DALRC has entered the 4-in-1 ESC field with a bang. 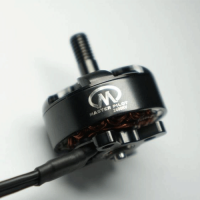 Their clean looking 4-in-1 was designed to give you smooth power towards your motors with great stability and durability. The 55 pieces of TDK 22UF 25V Low ESR capacitance has a total capacity of 1150UF give you that stability. Along with the 32bit MCU and Dshot 1200 capability, this ESC has everything you want in a 4-in-1. On top of looking great, the heatsink, effectively pulls heat away from the MOS tubes, protecting the critical parts of your ESC. Equipped with standard 30.5*30.5 mounting holes and extended solder pads for easy fixes or adjustments. Katana 5" racing frame Full 3K Carbon FiberThe pod designed for 28mm size c..
DALRC F405 AIO Flight Controller The DALRC F405 AIO comes equipped with a high-..
DALRC is back with another great 4-in-1 ESC. Similar to the Engine, the Rocket s..